This adjustable temperature thermostat, ETR200, for any enclosure, with either a normally open (NO) and normally closed (NC) contact, is used to control installed devices. Such devices could be a filter fan or a fan heater, that should turn on or off at the required temperature level, set by the user. The result is reduced operational cost. 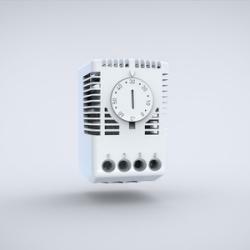 The product's versatility is high, since either cooling or heating can be controlled by the two different types of contacts that are housed within the same thermostat. Thermostat with changeover contact to manage any kind of device, heater or cooling. Sensor element thermostatic bimetal. Mounting clip for 35 mm DIN rail (EN 60715). 0 °C to +60 °C. Switching temperature difference less than 3 °K, and switching point tolerance ±3 °K. NC contact, 100-250 V AC, 10(2) A. NO contact, 100-250 V AC, 5(2) A, for 230 V AC operation only. 24 V DC, 30 W. Value in brackets for inductive load. Screw terminal for cable (0.5 to 2.5 mm²). Adjustable temperature thermostat, with a normally open (NO) and normally closed (NC) contact. The thermostat allows energy to flow to a device when the set temperature has been exceeded through the normally open contact (normally a cooling device), or when the internal temperature has dropped below the same set temperature through the normally closed contact (normally a heater). Customers are able to adjust the thermostat's temperature settings when equipment with special requirements are installed, such as batteries. The thermostat can only control one device at a time. The installed devices, such as filter fans or fan heaters, automatically turn on or off when they are required, which reduces the operational cost of the control panel. As the two different types of contacts are housed within the same thermostat either cooling or heating can be controlled, increasing the products versatility which reduces the amount of stock customers need to keep. Customers can adjust the required temperature, which means it can be installed in any enclosure. The normally open contact, is used to control cooling or high temperature alarms, and the normally closed contact, is used to control heating. The thermostat can only be set to one temperature, this temperature will therefore control the contacts, which means that only one device can be connected, however it can be used with either cooling or heating devices.